유럽의 대표적인 관광지인 베니스와 바르셀로나 등에서는 현지인들이 관광객들이 더이상 자신들의 삶에 방해가 되는것을 참지 못하고 공공연하게 관광객 출입제한을 실시하자고 한다. 관광으로 비롯된 문제점들이 언론에 보도된다. 중국 관광객들의 '행운의 동전 던지기' 또한 외국인들이 이해할 수 없는 행동으로 꼽혔다. 이들이 행운을 빈다는 명목으로 아무 데나 동전을 던지기 때문이다. 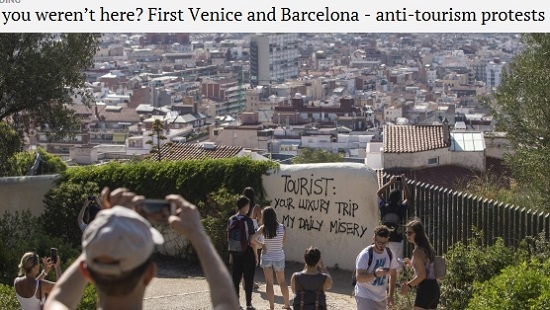 We’re all familiar with the airport check-in-desk meltdowns, assaults on cabin crew and vandalism at archaeological sites – not forgetting a propensity to urinate in public places. 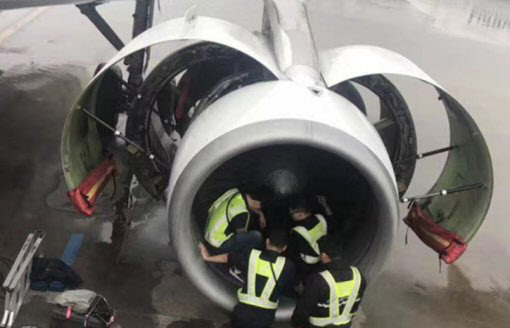 And who hasn’t thrown a few coins into a jet engine for good luck? 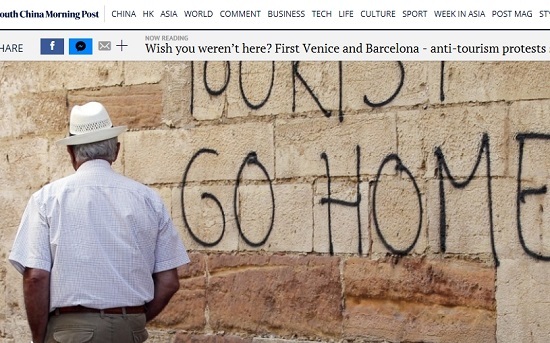 Ironically, Chinese tour groups may end up being the saviours of the holi­day industry in some parts of the world. They’re already helping to prop up destina­tions, such as Egypt, Turkey and Tunisia, that have suffered downturns in the after­math of terrorist attacks. 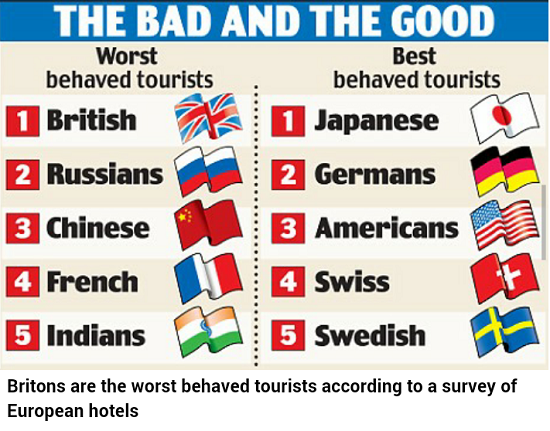 The mayor of Croatian resort island Hvar, fed up with loutish British tourists, last week announced fines of €700 (HK$6,200, US$800) for those caught drinking alco­hol in public. Also this month, Portuguese police fired shots in the air to quell rioting British clubbers. The next headline-grabbing episode of debauchery is only an all-you-can-drink sangria session away. 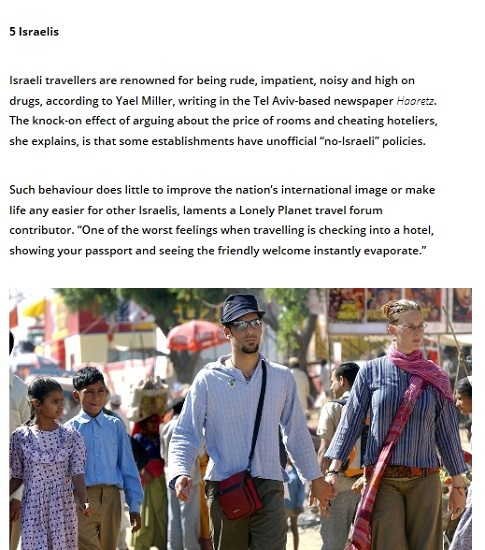 "미국인들은 만약 제멋대로 할 수 없으면 돈을 뿌려 제멋대로 할 수 있게 한다"며 "
Israeli travellers are renowned for being rude, impatient, noisy and high on drugs, according to Yael Miller, writing in the Tel Aviv-based newspaper Haaretz. The knock-on effect of arguing about the price of rooms and cheating hoteliers, she explains, is that some estab­lish­ments have unofficial “no-Israeli” policies. 러시아인들은 결코 웃지 않는다. 그들은 다른 나라 사람들이 그들을 좋아하지 않아도 괘념치 않는다. 러시아인들이 해외 관광지에서 물의를 많이 일으키자 러시아 외교부는 해외 관광객들에게 해외 여행 시 꼭 지켜야 할 에티켓을 다룬 소책자를 발간할 정도다. 최근에는 루블화 약세로 러시아 관광객이 좀 줄었다. 몇 년 전만 해도 러시아 관광객들을 전세계 관광지에서 흔히 볼 수 있었다. 특히 동남아 등 햇볕이 좋은 곳에는 러시아인들이 득실거렸다. 러시아인 42%가 스스로를 최악의 관광객이라고 평하고 있다. 그러나 관광지에서 러시아인들을 그리워하고 있다. 인간적인 면도 있기 때문이다. 2015년 유럽호텔에서 조사한 무례한 관광객 순위와 모범적인 관광객 순위. 상대방 나라에 대한 이해와 지식 언어 등을 쌓는것에서부터 시작된다. 방문국가의 다양한 문화와 언어, 상대방에 대한 존중 등의 다양한 교육과 경험이 필요하다.